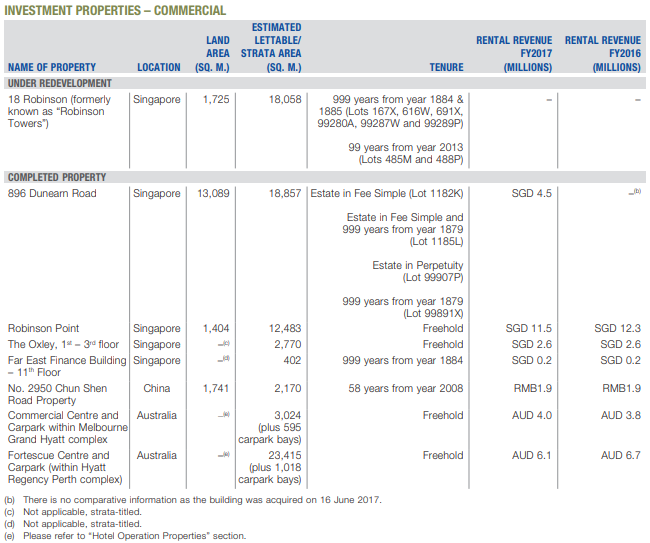 Company Description from SGX StockFacts - Tuan Sing Holdings Limited, an investment holding company, engages in the property development and investment, hotels investment, and industrial services businesses in Singapore, Australia, China, Malaysia, Indonesia, Europe, and other ASEAN countries. Its Property segment develops and invests in residential, commercial, and industrial properties; and provides property management services. The company’s Hotels Investment segment owns two five-star hotels managed by Hyatt International in Melbourne and Perth, Australia. Tuan Sing has always been on my watchlist and I have finally decided to enter it this week at $0.42. It was first brought to my attention by a friend last year but I did not buy because there were other opportunities or its price has gone up. 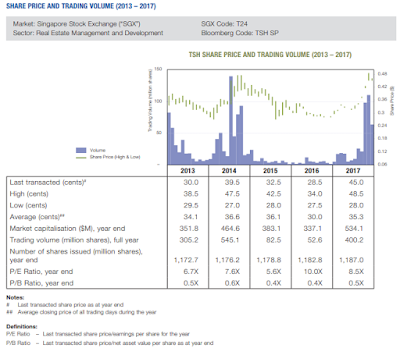 Since then, UOB has published a buy report and B from ForeverFinancialFreedom (Recent Action - Tuan Sing) has accumulated some too. 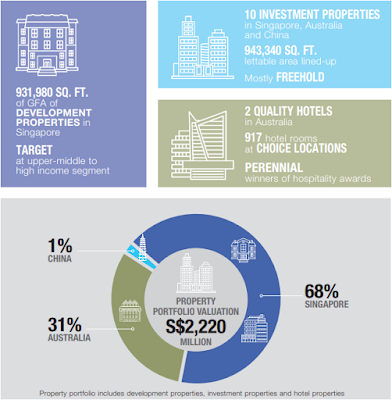 What I like about the company is that most of its properties are freehold. Some of the properties are at prime locations such as 18 Robinson and Robinson Point and there are others not captured in the above screenshot. Most importantly, it is currently trading at a steep discount (PB of 0.505). Its NAV based on the latest annual report is $0.83. Assuming if it was to trade at the industry average PB of 0.6594, the price would be around $0.545 (~30% upside from current entry price). What really caught my attention and led me to pull the trigger is the letter to shareholders. One of its agenda for the upcoming AGM is the renewal of the share purchase mandate. By doing shares buyback and keeping the shares as treasury shares, it reduces the number of issued/outstanding shares. This has an opposite effect as compared to rights/bonus issues (dilution on existing shareholders). The chairman gave 5 reasons/rationale for the share purchase mandate, do take a look if you are interested. 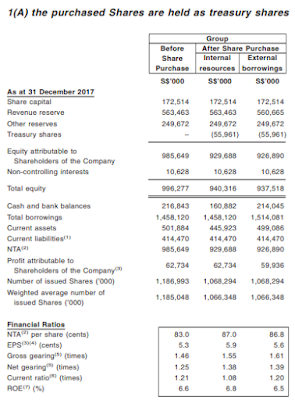 If the mandate is approved, its NAV will increase to $0.868 - $0.870 because there are now lesser shares available for the same underlying assets. What a bargain! Looking at its past 5 years performance, shareholders' funds and NAV has been increasing year on year. Dividend has been kept constant/increasing slowly over the years since 2010 and the yield is around 1.7%. During Oct 2014, it traded at a high of $0.475 with NAV of $0.683 (PB of 0.695). Over the next few months, it went to as low as $0.27 and has never "recovered" despite increasing NAV and dividend. 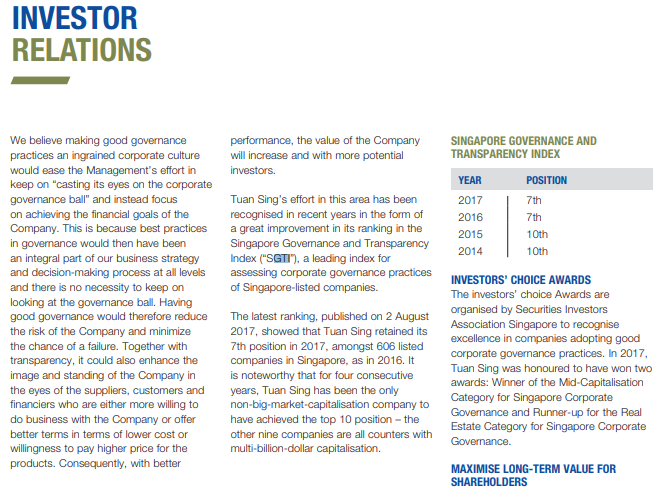 It is certainly not due to its corporate governance as Tuan Sing was ranked 7th out of 606 listed companies in Singapore based on the Governance & Transparency Index (GTI). This is a collaboration between CPA Australia, NUS Business School's Centre for Governance, Institutions, and Organisations (CGIO), and Singapore Institute of Directors (SID) and you can find out more information here. Current Profile: 28 years old male planning to get married this year and is still living with parents. Much lower but pretty high due to CNY, shall elaborate further below. Let me recompute expenses from our mutual fund (KPO Expense Fund), you can read more about how we manage our finances here. Technically, the expenses for February should be $1,799.61 - ($81.20 / 2) = $1,759.01. I gave Ang Bao (red packets) to my parents and grandparents during CNY as a small token of appreciation. The mutual fund expenses of $81.20 is due to us buying Bengawan Solo CNY goodies for both our families and I attended a colleague wedding this month. Collect bonus last month as well and treat my family to a meal at Dian Xiao Er. Love their Roasted Duck with Angelica Herb (Dang Gui). My food expenses are exceptionally low because I stay with my parents! I lost money while playing card games during CNY. I played an ancient game that many might not even know of its existence - Sì Sè Pái (四色牌). It is like a combination of chinese chess and mahjong. The pace of the game is pretty slow (I like) and is very suitable for the elderly/grandparents. The annoying thing is your hands will feel like cramping after a while. lol. I have been tracking my expenses without fail (every single cents including the cash in my wallet) since I started working. However, I do not budget because I believe that I am a KPO/thrifty by nature. Having said that, there is still a need to review and ensure that it is true. In addition, having a good grasp of the monthly expenses help in planning for financial freedom/retirement too! It is obvious I have brushed this aside since I am only doing a January update only now. Why now? I got motivated by 15HWW latest post - 2017 Expenses: Summary And Reflections. He has done it consecutively for 54 months! The plan is to start sharing only my own expenses. Once CZM and I get married and we stay together, the expenses update will be based on 2 of us as a family. 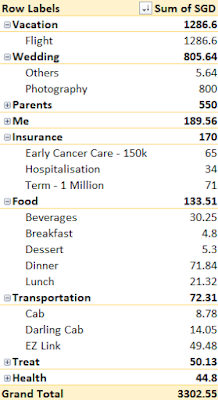 I think it will be interesting to look back and see how much our expenses change at different phases of life. $3,302.55 is pretty high due to Vacation and Wedding expenses. However, those are expenses from our mutual fund (KPO Expense Fund), you can read more about how we manage our finances here. Technically, the expenses for January should be $3,302.55 - ($1,286.6 + $805.64) / 2 = $2,256.43. I blogged about how we use miles to redeem one-way SIA Suites air tickets to the United States, New York previously - Redeeming KrisFlyer Miles for Singapore Airlines Suites = 38.6% Cashback! We finally booked the other way back home - American Airlines Economy from Las Vegas with an 8 hours stopover at Tokyo for $643.30 each. It was definitely much cheaper than we have expected! We paid a deposit for our actual day photography and bought some random stuff/props for the pre-wedding photoshoot. That is the monthly allowance I give to my parents. I bought a PlayStation game - Monster Hunter World for $75.25 and a one year PlayStation network for $44.34 (I got it during a promotion 12 + 3 months). The remaining $69.97 is the installment for Surface Pro which I got about 2 years back. There were some promotions by Uber so we took quite a few cab rides. 1. I am no longer using EZ Link Auto-Reload, Account-Based Ticketing (ABT) is a much better choice as you pay what you use instead of triggering top up where the money is stored in the EZ Link card. The best part is miles can be earned too! 2. Discount for commuters who enter stations before 7.45am on weekdays. As usual, CZM is the biggest beneficiary followed by my family. Fell sick and went to see GP. This amount is 100% covered by the company. 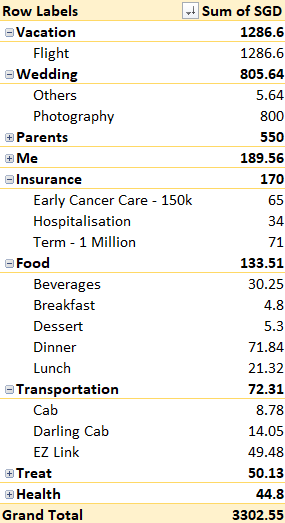 Technically, this is not a real expense but I decided to include it to keep the expenses tracking more realistic. 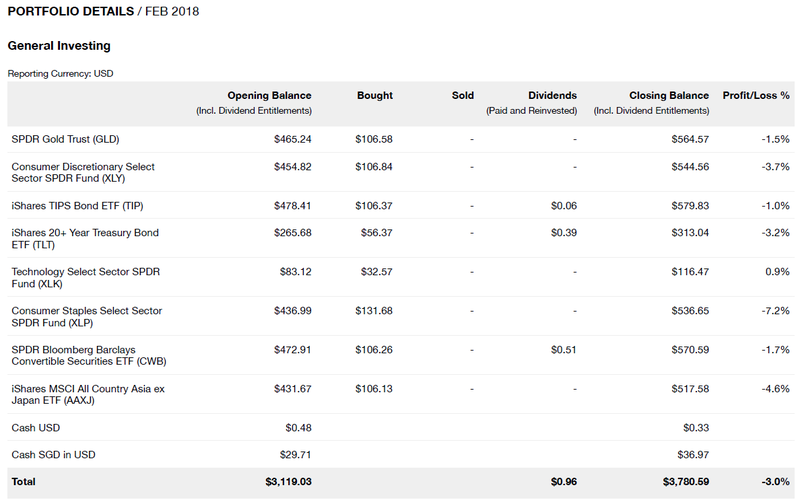 Based on the statement (28 Feb 2018), we had $6.65 profit. 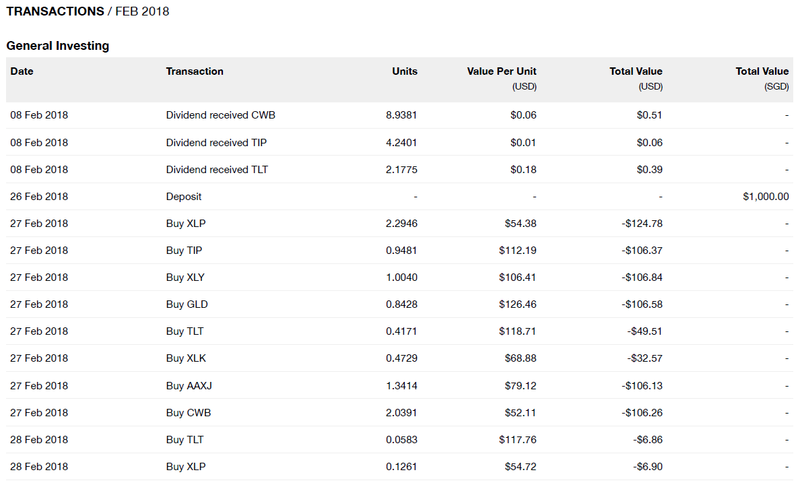 As of 13 Mar 2018, we have $22.24 profit despite a significant currency impact -$94.02. StashAway has improved the time it takes for our money to be invested significantly! I can definitely see/feel the difference. This month commentary: Although the fees for POSB Invest-Saver is 5 times higher, the return is about 9.5 times higher than StashAway! What can I say, StashAway lost miserably! Hahahaha. Will we stop? Of course not, we are still very far away from our goal. I briefly mentioned the possibility of using leverage to achieve a higher return in one of our last post - Red Red Market for Chinese New Year! Coincidentally, a week after my post, I began to see Warren Buffett's articles on social media about the danger of it. lol. Leverage is dangerous for many reasons. As one of Chinese saying goes, 没那么大的头，就别带那么大的帽子. The literal translation is "if you do not have such a big head, then do not wear such a big hat". In simpler terms, it means do not buy what you cannot afford. Having said that, if used appropriately/efficiently, one will be able to grow wealth at a faster rate. The idea is similar to how companies/corporate use debts to grow their businesses and others taking on bank loans to buy a 2nd property. Technically, what we are going to do is still very conservative (at least that is what I think, shall elaborate further later). 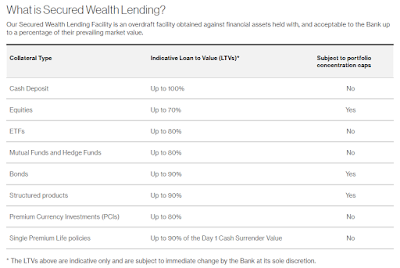 We will be using Standard Chartered Secured Wealth Lending at a fixed rate of 1.6% + 1-month SIBOR (~2.6% and higher). 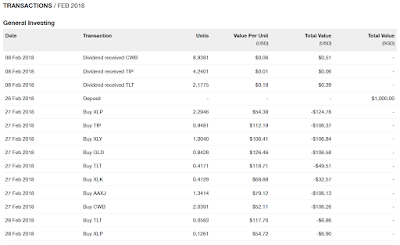 How this works is we will be pledging some of our stocks with them (you can pledge any other assets shown in the image above) and these assets will have their indicative Loan to Value (LTV) which is the amount you can borrow/leverage on. An overdraft account will then be opened and one can easily withdraw from it. One thing to take note of is the margin triggers as shown below. 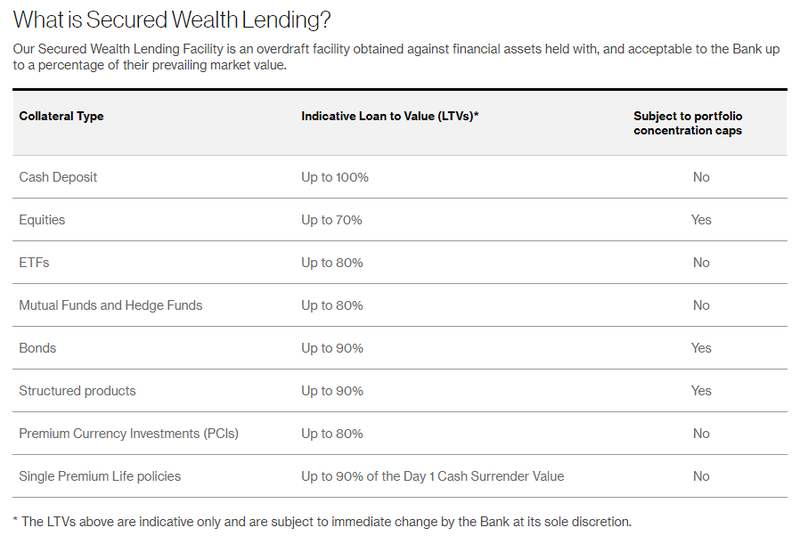 If the overdraft account is fully utilized (for simplicity, let's use $100,000 as an example), any decrease in market value of the pledge assets (stocks in our case) will result in a decrease in the LTV which would eventually lead to a margin trigger. Moral of the story, do not utilize everything that is in the overdraft account! At this point in time, you might not be able to understand the power of leverage. 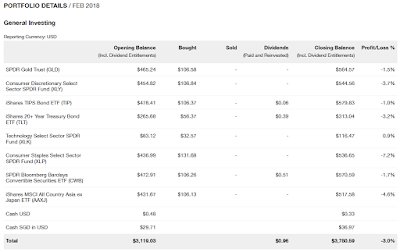 Assuming if I were to borrow the money at an interest rate of 2.6% and invest in a stock/REIT giving at least 5% dividend yield, what would be my return? If your answer is a pathetic 2.4% (5% - 2.6%), you are wrong! The return is actually around 92% (2.4% / 2.6%). This is not intuitive because the capital/cost of investment is actually just the interest/cost of borrowing. Even if 1-month SIBOR is to increase till ~2.4%, pushing the cost of borrowing to 4%, the return would still be at an impressive 25%. 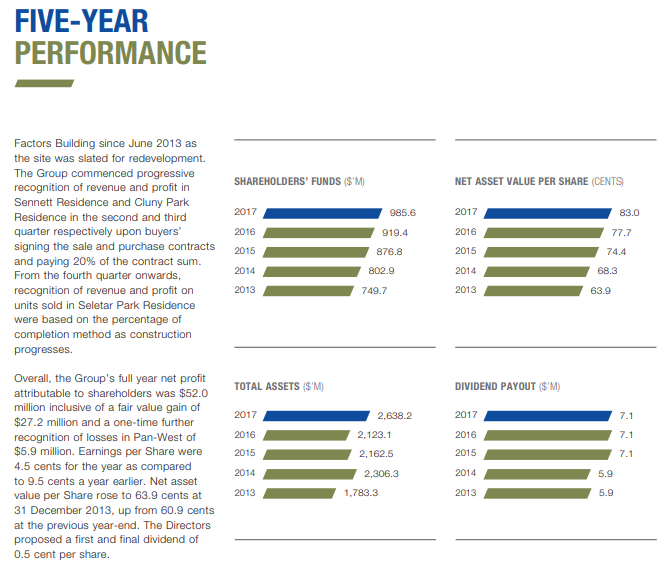 Did you notice how I assumed/kept capital gain/loss at 0% in both illustrations? Will that really be the case? Let's assume that everything is kept constant, similar to the Example 1 except that we suffered a -5% capital loss. The return would easily become -100%! A -25% capital loss would see it ballooned to -870%! Can your mind handle it? In the spreadsheet, I assumed 3 different scenarios that will cause the market value/LTV to fall ("High Chance" falls by 25%, "Bad" case falls by 50% and a "Worst" case falls by 75%). 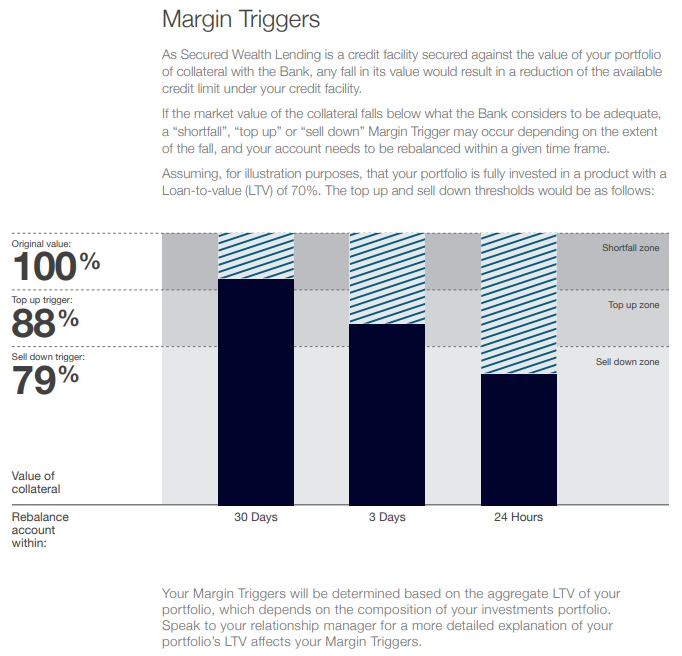 The 3 columns show the remaining LTV/credit that is still available before a margin trigger happens. As long as the font is black, margin trigger will never happen. This is important because it will be somewhat alight with our strategy of collecting dividends while ignoring the movement of the share price. Next, moving on to the rows highlighted in yellow and red. I mentioned previously that due to how aggressive we are in investing, we hardly have enough cash as "war chest". We believe in spending time in the market rather than timing the market. Using leverage/an overdraft account will address this issue of ours. The yellow highlighted row will be the maximum leverage we will be using under normal circumstances. The red highlighted row will be the maximum leverage we will be using when the market crashes. The plan is to use $10,000 now, deploy another $20,000 when the market falls by 25% from its high and deploy a further $25,000 if it falls by 50%. At the end of the day, it is actually a lot more complicated because there are so many variables (SIBOR, share price, dividends, etc.) that will be out of your control. Why do I still find it conservative? Our "gearing" will be extremely low at ~3% ($10,000 / $300,000) and it can be paid off easily as long as both of us are still working. The margin trigger will never happen because we will never be fully leveraged. This is very different from CFD margins where capital loss can force close your position. Such scenario will never happen to us. 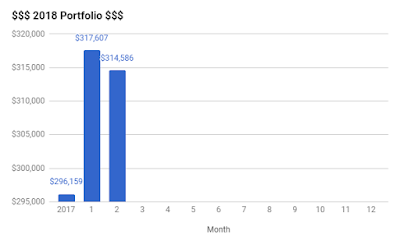 There is another blogger - S-REIT Investment Blog who is using leverage with > 30% gearing and his cost of borrowing is slightly higher at 2.88% and 4.38%. The article would not be complete without KPO sharing his spreadsheet, you can play with the numbers if it ever interests you here. The next step is to pick a stock/REIT! Disclaimer - KPO and CZM are not recommending the use of leverage. We are merely blogging down some of our thoughts/ideas so that we can review them few years down the road to see how stupid/smart we were. 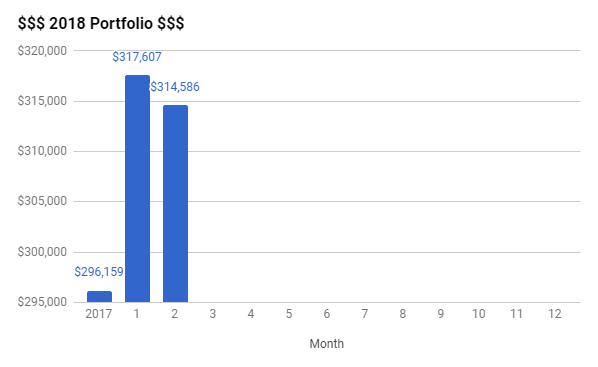 Our portfolio decrease by 0.95% to $314,586 - $7,789.56 of capital injection and $10,810.46 of capital reduction. The month ended better than expected, it was definitely much worst before CNY - Red Red Market for Chinese New Year! No need to panic sell! 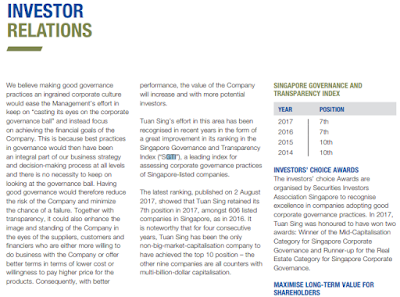 Sheng Siong has been one of CZM all-time favorite stock as it is defensive in nature. Regardless of how the economy is doing, we still need food and daily necessities to survive. We last bought Sheng Siong in August 2017 and that was around the time Amazon entered our market. It is evident that the increased competition online did not have much of an impact in Sheng Siong FY 2017 result with EPS increasing by 11.3%! The older generations are still more resistant towards getting grocery online (they think it is not fresh). Having said that, the lack of an online presence is a concern as we have seen how technology has disrupted what used to be a solid cash business such as SPH and Comfort Delgro. Let's see how it goes. 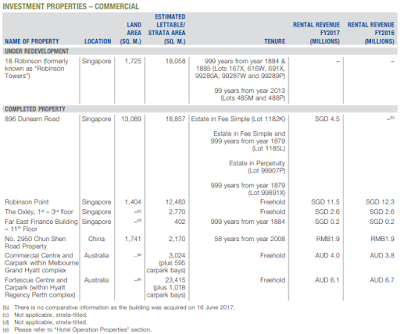 The Singapore Budget 2018 was announced this month and while everyone is talking about the increase in GST, we prefer to talk about the tax transparency that was extended to REIT ETF - New Singapore Budget, New REIT Strategy! With that, we will be making another attempt to do DCA in Lion-Philip S-REIT ETF on a monthly basis. 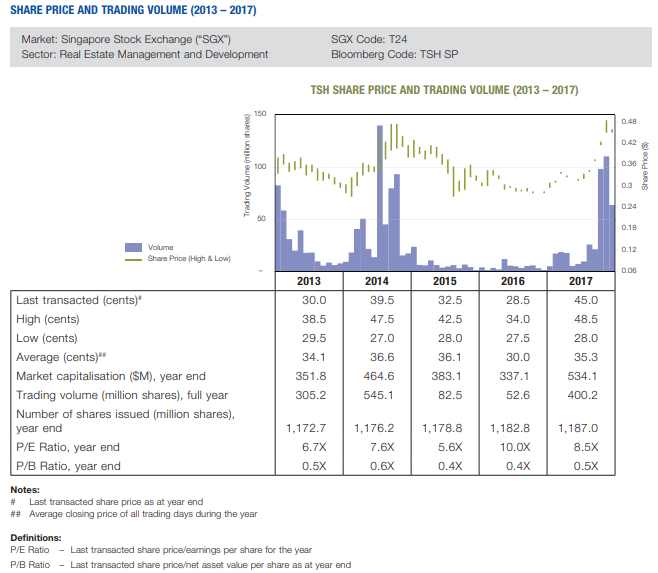 First REIT had a DRIP (Dividend Re-Investment Plan) where investors can choose to take the cash dividends or take the shares at a discounted rate of $1.3656 (not so much of a discount if we look at it now). The cons of participating in DRIP is that you will almost always end up with odd lots but one can reinvest the dividends efficiently without commission. The UI is slightly misleading, showing green when it is losing money. lol.